SOME ILLSEED MODELS FOR DIDDY! Just so you know, the open call for Diddy's models passed. What I am doing is posting up some faces that hopefully will get you some much needed attention. Here is a winner Diddy! Her name is Whitney Deak, she is 15 years old and she is an aspiring model and singer. Be easy on the comments, savage ones. She has a mother and a father that read AllHipHop! It is a family affair! Nobody can accuse Jay Tieri and Nick Wallace-Cyman of playing it safe. At the first Viking Idol competition held last week at Homewood-Flossmoor High School - with the finalists to open a benefit concert today featuring singer-songwriter Pete Francis - the two seniors played a song by Francis' former band. With Tieri on lead vocals, they strummed acoustic guitars for "Flying Horses" by Dispatch, the band Francis was with before going solo. The daring move impressed the judges during the contest inspired by the TV show "American Idol." "I definitely liked the guitars," senior Elise Brown said. Business teacher Mike Patterson knew to expect something special when he saw the duo warming up. "I could tell you were fired up," Patterson told them. Afterward, Tieri said they played a Dispatch song, "because it would be real cool to nail this audition, get in front of Pete, and put our spin on his stuff." "Viking Idol" featured an eclectic selection of songs from a sometimes amazing talent pool of 27 acts. Rap songs, Disney ballads, rock and show tunes were heard. And then there was a trio that did all it could to not remind judges of Francis. "We knew the other bands would be playing more Pete Francis-type stuff. We thought we should do something that would stand out in the judges' minds," Joe Rosner, lead singer of Platybelodon, said. That's why he, guitarist Landon Coateswelsh and bass player Luke Oppenhuis played "Yoshimi Battles the Pink Robots," a 2002 release by The Flaming Lips. They sounded good, although the band's drummer, keyboardist and guitarist had a previous commitment. The strategy worked, as only Patterson knew the song. "It's different," judge Mike Adelman, a senior, said. "That's what we were trying to go for," Rosner said. Judge Alec Schwartz, a senior, praised Rosner's harmonica. "I got it at The Dollar Store," Rosner said. The panel was impressed by sophomore Nate Aikens, who wrote and performed a rap about Invisible Children. "It took me about an hour and a half, with distractions, to write. I'm liking our chances," said Aikens, who performed with sophomore singer Jasmine Bishop. Judges found something to like in everyone. There were no acidic comments, ala famed sourpuss Simon Cowell of "American Idol." "The main thing with this is we're trying to find the hidden talent at H-F. It's a big school, and I'm realizing we're surrounded by talented people," Adelman said. Seniors Jacob Gonzales and Andrew Koenig also were judges. The idol finalists were announced late last week. They are Plighty Beldon, Jasmine Bishop & The Protege, Whitney Deak, JT & Wally, Homemade Jam and Doody Jones. They will open the Pete Francis benefit concert tonight and the winner will be voted on and announced at the conclusion. The concert starts at 6:30 p.m. at the high school. Steve Metsch may be contacted at smetsch@southtownstar.com or (708) 633-5996. Please contact Mike at D5 Entertainment-- reignonmusic@gmail.com for bookings and further inquiries. Reign, a 17 year-old starlet out of Chicago, recently featured on the urban entertainment site, AllHipHop.com, continues to inch closer towards her dream of becoming an international superstar. With a unique voice that has been compared to Beyonce and a commanding stage presence--this young talent is no stranger to the stage. She recently opened up for well-known acts such as Jazmine Sullivan, Rick Ross, Twista, OJ da Juice Man, and has sung the National Anthem for the WNBA Chicago Sky just to name a few. Just recently, Reign received a write-up in Chicagos True Star Magazines spring & summer issue. Shes a bonafide superstar! Reign refuses to allow any obstacles to stand in the way of her aspirations. Since the age of four, Reign has always dreamed of achieving super star status. Blessed with not only her God-given talent for singing, she also writes/co-writes her own material and has dance skills and precision of Ciara and Chris Brown. Shes definitely a triple-threat! Reigns musical style is embodied by a diverse collection of musical influences which allows her to incorporate her love for R&B, Pop and Alternative Rock. Reigns distinctive voice reflects a vast cross-over appeal that has the capacity to reach many musical genres. 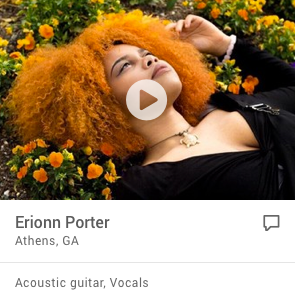 Her smooth beautiful voice attracts the attention of even the most cynical of skeptics. 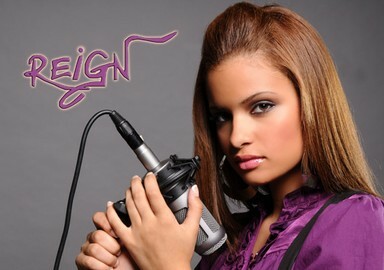 Some of Reigns influences are Lauryn Hill, Brandy, Mary J. Blige, Christina Aguilera and Avril Lavigne. Reign - fighting her way to the top and not stopping until her voice is heard! I typically sing a melody of my original songs. as well as numerous cover songs. I may change the songs up periodically, depending on the venue. Performances range from 10-20 mins. Could be longer depending on the needs of the event.